is the start of finals for our U16 team (whose finals start two weeks earlier than our younger teams). Our boys finished on top of the ladder undefeated which is a sensational achievement. The first day of this two day match will be played at East Burwood North Ground. I know it will be hard for everyone to go and support the boys (as all other matches and Milo are still playing), however come back to the club rooms afterwards, and we can hear directly from Buddy and the boys to hear how they went. If you do not yet have an envelope, please contact your Team Manager – or let me know. Please also return all envelopes to your Team Manager, Paul (or place in the box by the bar in the Club Rooms by tomorrow night). A massive thanks to Jean-Paul Lefebure for organising this. 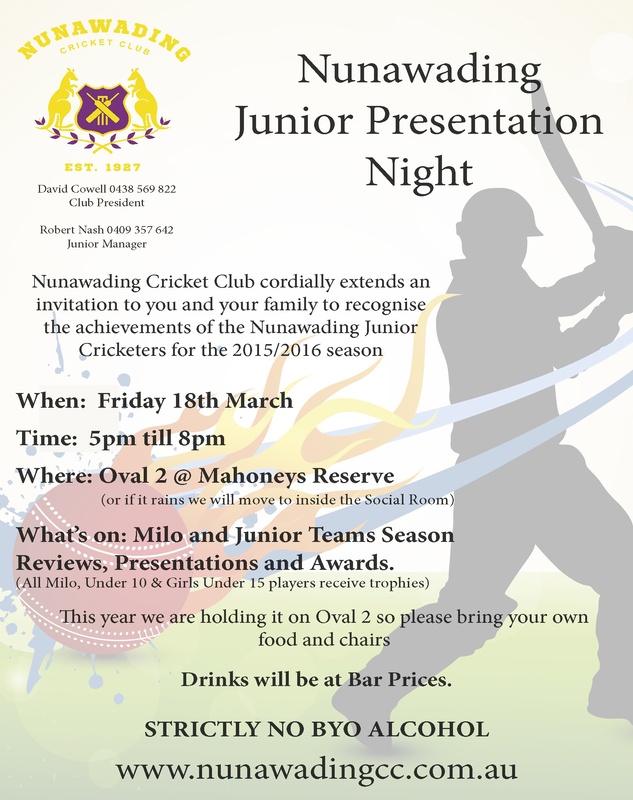 As mentioned last week, our Presentation Night for all our Junior Teams and Milo will be on Friday 18 March. Attached is your invite to what will be a great way to celebrate and the season and recognise all our children’s achievements. It was great to see such a successful day of cricket played on Sunday against Blackburn. Everyone had a great time, and there was some amazing cricket played (Cam MacPhie – have you heard from the owner of the car yet, who you put a cricket ball into after your big 6)? Next season we will do it again – at Mahoney’s Reserve on 3 ovals!! Special thanks to Blackburn Cricket Club for hosting the day. With only 2 weeks left before the clubs senior teams start their finals, it looks as though all 6 teams will play in finals. This is a great achievement for the club – one I know our seniors are hoping will generate some further success. I will be providing details of these matches in my weekly reports – over the coming weeks. Our U12s have had a solid season this year. Russell and Jordan have worked with our boys and girls as they continue to develop their cricket. In addition to the regular training nights, the players have had additional training throughout the season from Lal (level 3 Coach) and also Dave Cowell who has run some varied coaching sessions. Whilst neither team will play finals, Russ’s team has played against some high quality players/teams, and Jordan’s team have certainly continued to enjoy their cricket. I thank all the parents who have also helped this season with these teams (Wendy, Chris & Wayne, Suzie, Deb, Chris B to name a few) and ensured the teams were well organised.